Eternity Villa will make you wish you could stay there forever! Located just minutes from restaurants and stores, the villa has 5 large bedrooms with every amenity you could ask for. There is also a fully equipped kitchen, comfortable living area with modern furnishings, and a dining table that will seat everyone. Outside you’ll find two pools, another dining table for meals al fresco, and comfortable seating for lounging and taking in the view. Flamands and Colombier Beaches are close by where you can swim, snorkel, and relax in the sun. Contemporary in design, 2 pools and a gym. Eternity is located on a Flamands hillside with views of the mountains and the sea. This villa is ideal for entertaining, with two pools and several open floor plans. The villa’s upper level has a large terrace with lounge chairs near the pool. A nearby Jacuzzi is the best place to enjoy a glass of wine under the stars. There’s also covered dining and several sitting areas on this level. On the lower level, the entertainment terrace is equipped with a Bose sound system, lounge chairs, and an infinity-edge pool with a swim-up bar. The air-conditioned fitness room is equipped with cardio equipment and weights, perfect for any workout. The open floor plan Great Room starts with the living area, which blends with the upper terrace. A flat screen TV, ample seating, and access to the terrace distinguish this area from the rest of the room. The large dining table stands between the living and cooking areas. The sleek, galley-style kitchen features modern appliances and cookbooks. Five bedrooms can accommodate 10 guests, and each enjoys terrace access. Every bedroom has a queen-sized bed, flatscreen TV, air conditioning, and an ensuite bathroom. The master bedroom has its own massage room and al fresco shower, perfect for the host and hostess. 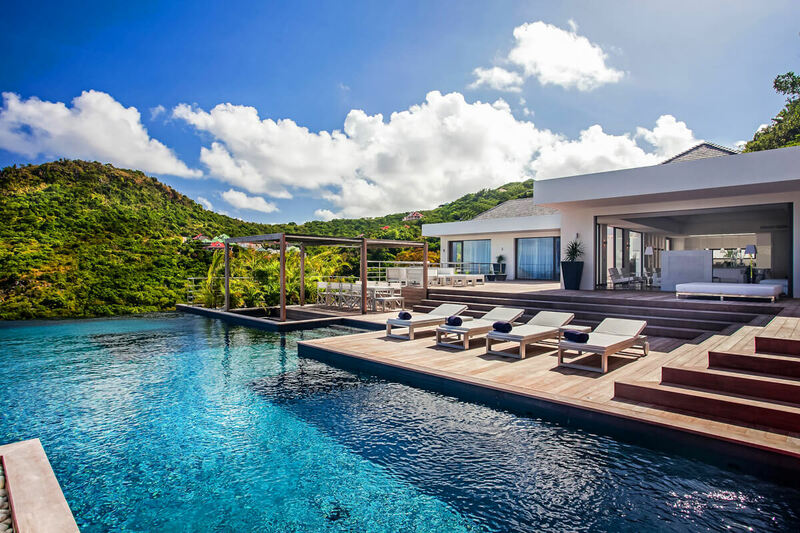 Eternity Villa is less than 10 minutes away from Gustavia, which has boutiques, fine dining, galleries, and gift shops. The closest restaurant is only 2 minutes away, and guests will love Flamands Beach’s white sand and surf.